It is hard to know where to start when words have failed. For me, the choice will always be to turn to cloth and stitching. A little over a month ago I got an email from a very very close friend. Friend isn’t even the right word, as this lovely young woman has really become a part of our family the past four years. To make a long story short, it turned out that she had grown a large tumor on her left kidney that was causing some major problems in her body. She and I had had dinner a few days before I got the email and I had noted she was tired, but chalked it up to the life of a harried graduate student. I accompanied her to the doctor’s appointment where we learned about the tumor. She had gone to the ER over the weekend with pain and other symptoms and they had run a CT scan and found it. I can’t even begin to describe what it was like to sit in that room and hear those words. What makes it even more intense was the knowledge that my dear friend had lost her mother to lung cancer when she was an adolescent. Like my friend, her mother had been exceptionally healthy and fit and had no risk factors. She and I had spent many conversations discussing life and this was one of her biggest fears realized. The next few hours were spent in a flurry of phone calls and emails. All of my friend’s family is in the DC/VA area and it was clear that this tumor needed to come out ASAP and would be major surgery requiring a major recovery period. Within 24 hours of learning this news, her sister flew up, her best friend made a million calls to set up appointments and care down south, tons of friends came to wish her well, and she was on a plane. Watching her drive off was one of the hardest things I have had to do. I knew she was going to be well taken care of, but it is hard to let go. 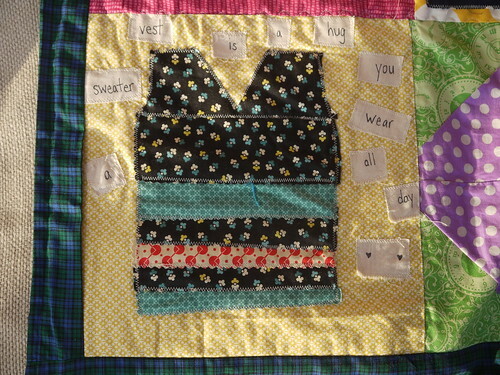 One of the things she and I spent a lot of time doing together was sewing. We both share a deep love of home and hearth and cooking and hosting and sharing hand made things. After she got safely to her family there was little for me to do here but wait. Her surgery was scheduled for ten days after her arrival as her surgeon wanted to run numerous tests first. I don’t do well with waiting. I needed a project. 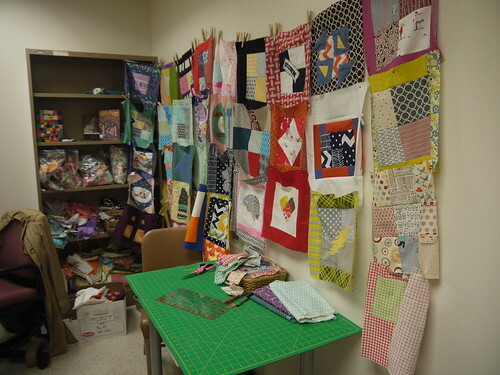 And so, with some coordination from some amazing faculty and staff in our department, I was able to pull together a community quilt project for her. 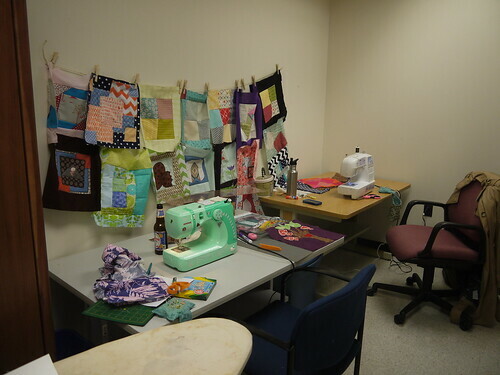 I grabbed a ton of fabric from my stash, a few machines, and tons of supplies and set up shop in an empty office in our building. My goal was to get 25 squares made. The first day started out a bit slow, but by the time lunch came around, things started hopping. 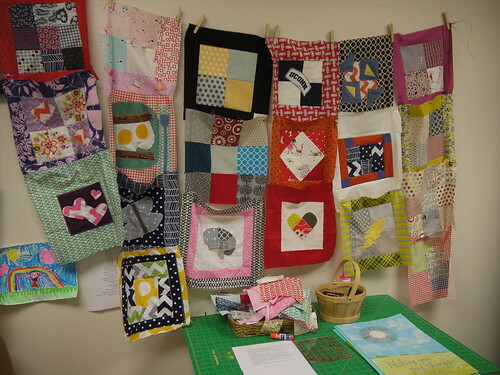 People came in wanting to sew a square who had never sewn before. At one time we had three machines going. One of the things that is important to know about my friend is that she coordinated one of the major TA courses and so interacted with a huge number of graduate students and faculty members. Everyone wanted to come in and do something. Sometimes, when a beautiful, healthy, kind, intelligent 29-year old woman grows a giant tumor on her kidney, just signing your name to a card isn’t quite enough. It is pretty extraordinary to see people that you know and have interacted with for many years (I have been a part of this department since 2001) try something new and step out of their comfort zone to make something for another person. By the end of the first evening we had over 30 squares done. I had brought three with me to start (made by us). It was incredible. I had made a little “inspiration board” with a poster and pictures of things she likes. As people finished their squares, I started hanging them on the walls. I loved seeing the way the room was transformed. 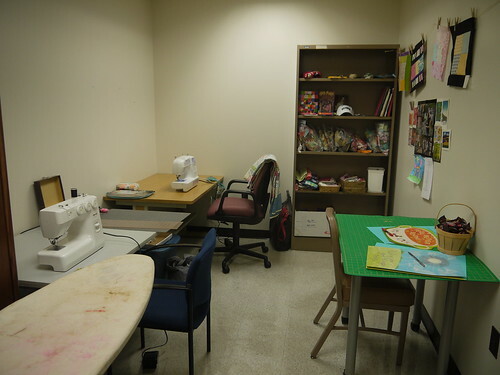 Ironically, that space had been one of my offices for a semester a few years ago. People made squares that matched their clothes. People made squares that matched their interests. People made squares and more squares and more squares. They inspired and supported each other in the very definition of collegiality. All-in-all, I was on campus for one full day and two-half days. 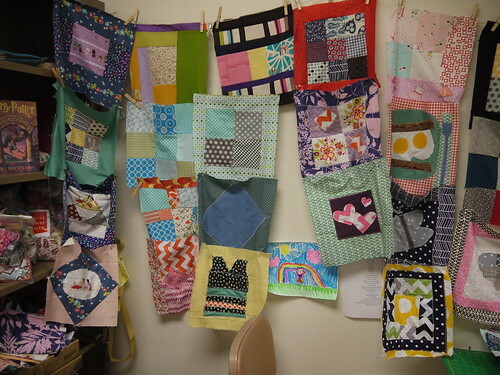 At the end we had 60 squares, enough to make a reversible quilt. 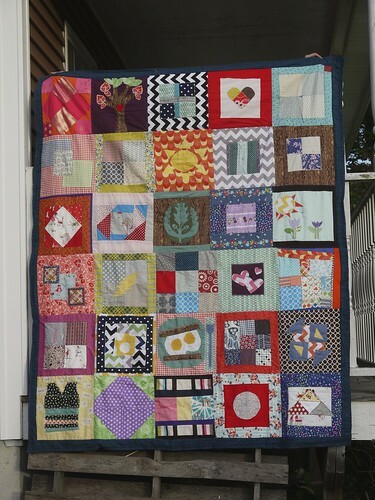 The original plan had been for me to put it all together and FedEx it to her before her surgery, but her best friend had a better idea. She was traveling down two days after the surgery and wanted to bring it with her and give it to her in person. Of course. It was perfect. 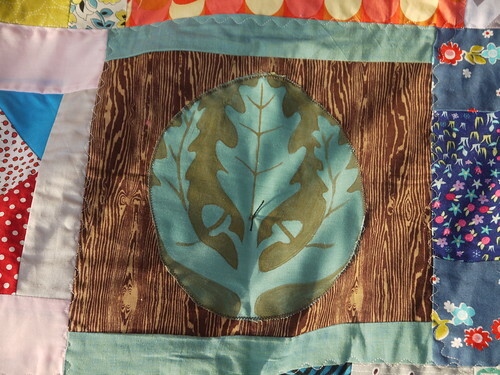 The way the quilt came together was magical. I had sorted the squares to make sure that the front and back were balanced. I had been having people use a 12.5″ square template so I only had to do a tiny bit of trimming. First I stitched the columns and then the rows and I marveled at how lovely it all was. It exceeded every expectation. From the time I started laying out the squares, to having it finished was only a day (with soccer in the middle). 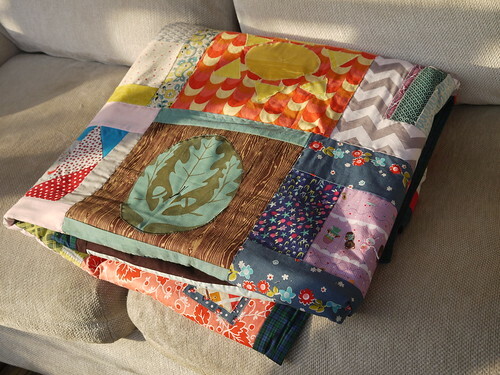 To quilt it, I just put each “top” on a sheet of batting and stitched along the seams in both directions. I then added a 3″ strip of binding to both sides and then stitched those two sides together in the same way you would make a pillow case. 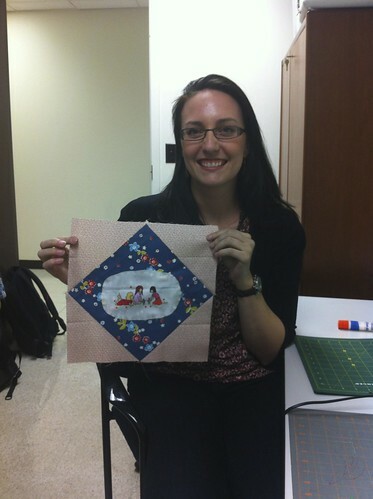 When it was done, I turned and top-stitched around the edge. 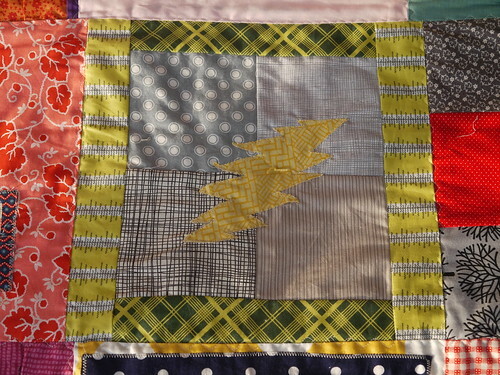 After it was washed a dried, Miss C and I hand-tied the center of each square. 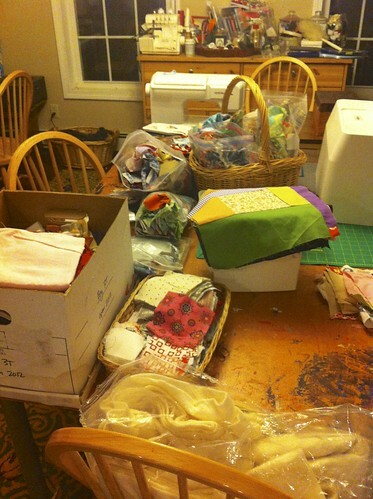 It will keep it together better and also makes it that much more lovely and homey. Doing this kept me busy and occupied in the midst of so much waiting and uncertainty. It was the perfect project in many ways. 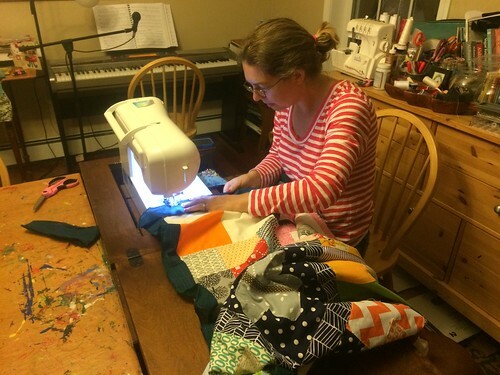 While in the midst of the quilt-project we got great news that all of her tests revealed that there was no evidence of cancer anywhere else in her body. Her surgery went very smoothly and they removed the tumor, which was in fact cancerous. I just got back from visiting her this past week and got to go to the follow-up appointment with her surgeon. This time, it was all good news! The cancer is gone (clean margins!! ), she is healing well, and will be monitored with MRIs and bone scans regularly for the next few years. She can go on to do all of the things young people hope and dream of doing like finishing graduate school, getting married, and maybe even starting a family!! 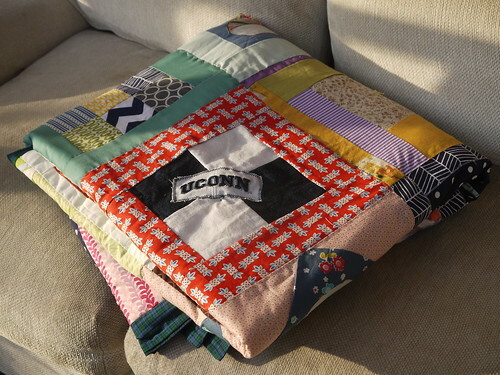 The quilt was indeed hand-delivered to her in the hospital a few days after surgery. The words I got were “speechless,” “overwhelmed,” and “amazed”. Due to the beauty of technology like snapchat, video texts, and Skype, I got to witness the moment of unveiling and then talk with her about each and every square. During my visit we got to repeat this process in person. We talked about each square and who made it (I had taken pictures of each person with their square) and how impressed we were by everyone and laughed and cried and laughed some more. Because it has two layers of batting it is exceptionally warm. Because it was made with so much love and care, it is something I know she will treasure forever. 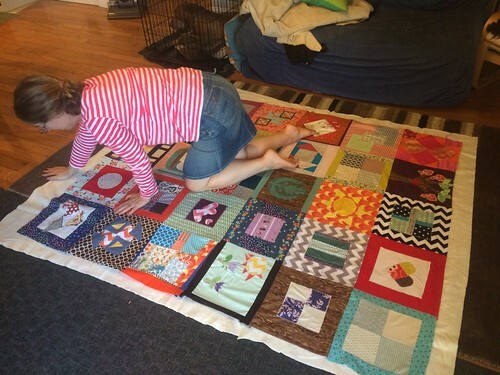 To be able to facilitate this for her, and for all of the people who didn’t think they could make a square was a very meaningful experience for me. Her best friend, another graduate student, and I became close through this experience. She said to me, “I am the brains, she is the heart, and you are the hands.” Truer words have never been spoken. Everyone should be so lucky to have such a collaborative friendship. 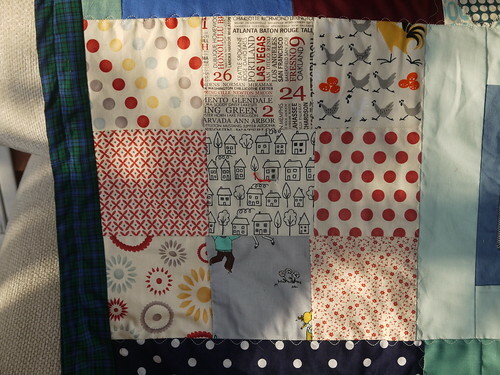 Each square has a story and I wish I could share each and every one here. They all have meaning and symbolism. I cannot begin to thank each and every person who did this for her enough. There really aren’t words to describe this feeling. It is an experience I will treasure for my entire life. So often we here about the bad things people do, but in truth, people come together every day to engage in acts of kindness big and small. What a wonderful and moving post…made me cry! 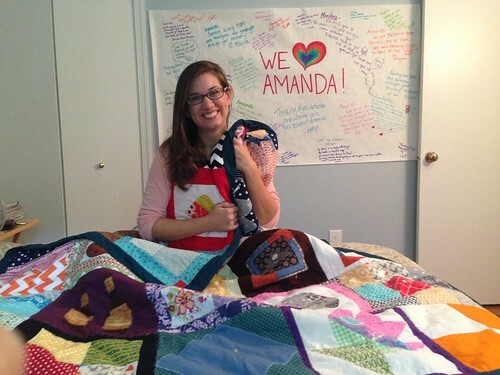 Such a feel good story..thanks for sharing…and Amanda…get better soon!!! This is beyond incredible. Loved every moment of it. a wonderful narrative of love and compassion thank you Jamie for sharing. It’s a blessing to know you. This story totally made me cry – what a wonderful thing to do for your friend, and I’m so thrilled that she came through the surgery with good news and a healthy report for moving forward. What a beautiful and moving story. 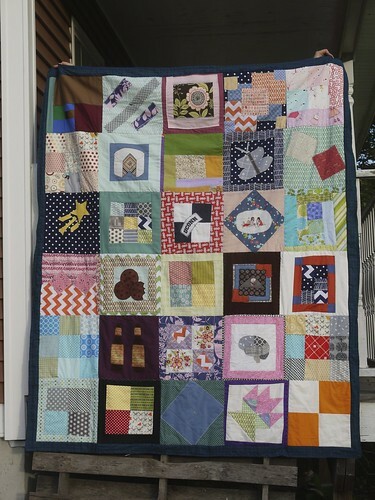 The quilt is amazing and will literally wrap her in love for her entire life. I’m so happy that the ending is happy and that Amanda has a clean bill of health. Thank you so much for sharing. You are a wonderful person and your compassion is inspiring.